I’ve written about student loan debt and college costs in the past. A report I recently completed on the issue was released earlier this week, you can read it here . It is long and detailed so even if your aren’t that interested in the topic it is an effective substitute for a strong drink or a mild sedative as a sleep aid. The report didn’t get a lot of media coverage and in any case it is difficult for media coverage to capture more than a few highlights of a long study that deals with complicated issues (although Kevin Landrigan at the Nashua Telegraph did his usual good job, as did Kathleen Ronayne at the Concord Monitor). One small portion of the study that I think is interesting and important examines the issue of competition in higher education as a contributor to higher tuition levels. Colleges in New England and the Northeast have higher tuition prices on average than colleges with similar characteristics (public, private, selectivity, state support, etc.) located elsewhere in the country. No doubt the region has some of the finest higher education in the country but not every institution in the region is world-class with an ability to charge a premium for educating students. I thought state-level differences in cost-of-living would account for some of New England’s and the Northeast’s higher tuition prices but multivariate (regression) models using data from about 700 four-year colleges and universities across the country failed to demonstrate that cost-of-living differences were significantly related to differences in tuition prices among universities with similar characteristics but in different regions of the country. One characteristic of higher education in New England and the Northeast that distinguishes them from other regions of the country is how many colleges and universities are located here. It is possible that increased competition for students and for faculty could increase college costs in New England and elsewhere. To date, few colleges and universities have been willing to compete on price. Colleges generally compete by offering more and better faculty, facilities, student services, and amenities. Colleges want to be the best they can be and they compete for students, for faculty, and with businesses for talent (PhD’s in fields in demand). This is especially true in a region like New England where there is a high concentration of higher education institutions and where there is a large base of technology, business, and professional employment that is more likely to employ individuals with advanced degrees and to compete with colleges for available “talent”. To test the degree to which competition among colleges might influence regional college costs and prices, I had to develop a meaningful measure of competition among colleges. The study operationally defined the level of competition among colleges in each region as the percentage of regional employment that is employed in higher education. Specifically, I calculated a “location quotient” for higher education employment in each state and averaged the location quotients for each state in a region to arrive at regional location quotients for nine census divisions (regions). This measure roughly approximates the degree of choice students in each region have regarding college enrollment. 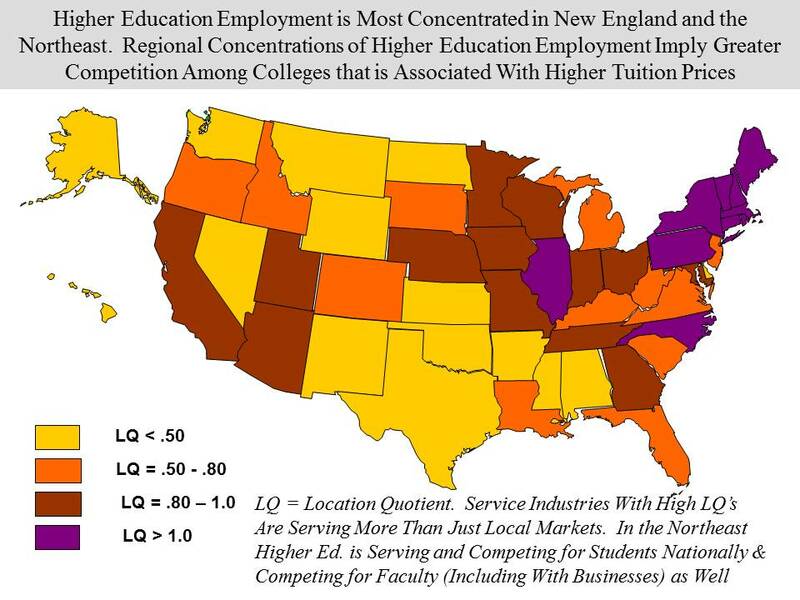 The figure below highlights regional differences in the concentration of higher education employment. I won’t get into a discussion of location quotients (LQ) but a LQ of greater than 1 for a service industry indicates it is serving more than local markets and is also “exporting” its services. We know colleges in New England attract student nationally and internationally. The darker regions of the country are where there is a greater concentration of higher education employment (and thus the potential for competition among them). Testing the impact of the LQ measure of regional competition on tuition and fee levels shows the variable to be significantly related to tuition levels at both public and private colleges, with regional location quotients showing a larger impact on tuition and fees at private colleges than at public colleges (implying that competition for students at private colleges has a greater impact on prices than it does at public colleges) . The elasticity of tuition and fees with respect to our measure of competition was small (.10) at private colleges, and even smaller (.076) at public colleges. 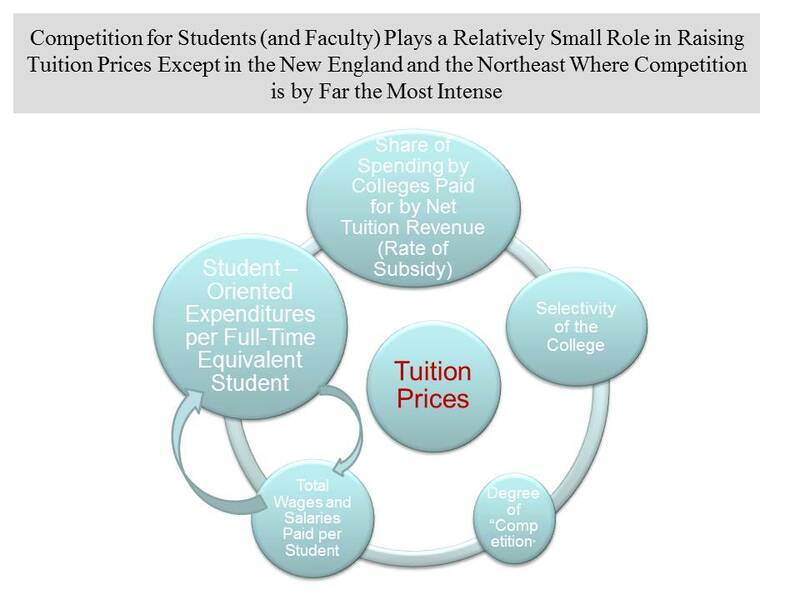 However, as the chart below shows, the magnitude of the difference between higher education employment in New England and other regions is great (indicating much higher levels of competition among colleges in the New England region), so this small elasticity still implies that competition has a relatively large impact on tuition and fees at colleges in New England. As an example, New England’s location quotient of 2.35 is about 140 percent larger than is the location quotient (or concentration of higher education employment) in the South Atlantic region. The elasticity of tuition and fees at private colleges with respect to this measure of competition suggests that for every 10 percent increase in higher education competition in a region, tuition and fees will be one percent (1%) higher. Thus the 140 percent difference in higher education competition in New England compared to the South Atlantic region implies that all else equal, we can expect tuition and fees at private colleges in New England to be 14 percent higher than in the South Atlantic region. For public colleges, with a smaller elasticity of tuition and fees with respect to competition, these results imply that tuition and fees would be about 10 percent higher in New England as a result of higher levels of competition among colleges in the region. I think these findings have important implications for tuition prices, student debt, and higher education in New Hampshire and New England and their economies. The biggest reason student debt levels are so high in New Hampshire is the fact that the primary strategy used by families for reducing the cost of college and for limiting student debt is attending a lower cost, in-state, public institution. Over the past decade more New Hampshire families have attempted that and with little success because of the high cost of attendance at New Hampshire’s public colleges and the low levels of grant aid awarded by them. State aid plays an important role in tuition prices at public colleges (just as endowments do at private colleges) and has a big impact on NH’s prices but even accounting for differences in state aid, competition for students and faculty appears to be contributing to higher tuition prices among public (and private) colleges in the region. Like all of us colleges want to be the best they can be and they compete with other colleges on national and regional rankings to prove it. A sad byproduct of that is that most rankings count per student spending heavily in their assessments so that any college that can offer as good or better educational services while restraining expenses will suffer in national rankings. It is important for public institutions to remain a key strategy for families in limiting the cost of college and student debt. It is probably more important now than national rankings and competing for a shrinking population of college age students. Competition is a wonderful thing and it is addicting (I know – it is my drug of choice). I am a believer in markets and I believe that the market for higher education is changing and will result in more price competition among private and hopefully public institutions. The competition won’t be on price exactly, it will be based on “value” not just price (it won’t do anyone any good to say I got the “cheapest” education unless the result of that education is greater opportunity for success in the labor market and in life). Competition among public colleges and public colleges with private colleges could accelerate market-based changes in higher education by focusing on value, not on facilities, amenities, high-profile faculty or programs, or whatever basis colleges typically compete on. Given the fiscal realities of states, colleges will not be able to compete with private institutions by spending more to be the best. When you can’t effectively compete on one field you are wise to move the competition to one more favorable to your chances of success. Public colleges can do that and parents and families in New Hampshire and New England looking to limit college costs and debt would be winners if they did. This entry was posted on October 9, 2013 at 12:16 pm and is filed under college, Education, Educational Attainment, higher education. You can subscribe via RSS 2.0 feed to this post's comments.